FXOWLE, Epstein, and Tishman Construction, an AECOM company, have completed the Jacob K. Javits Convention Center's comprehensive renovation and expansion project. As one of the city's primary venue for trade shows, large conventions, and special events, and one of the the busiest convention centers in the United States, the Javits Center's $465 million revitalization has secured its position as "Marketplace for the World." 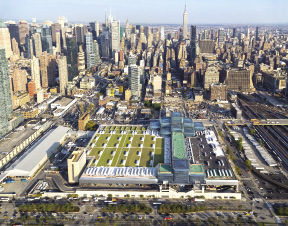 Since the project's beginning in 2009, FXFOWLE, Epstein, and Tishman Construction have restored the Javits Center's technological promise and overhauled its environmental and quality-of-life impact. The project includes a complete renovation and modernization, a northward expansion, and a comprehensive sustainability strategy. The building's appearance, systems, urban linkages, and day-to-day performance have been transformed, while the original space frame and overall functionality have been maintained. With a commitment to sustainability and a focus on efficiency, the repositioned building is pursuing LEED Silver certification. 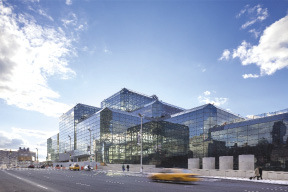 "The Empire State Development, the Convention Center Development Corp. and the Convention Center Operating Corp., gave FXFOWLE, Epstein and Tishman Construction the unique opportunity to give the Javits Center a new life," said Bruce Fowle, FAIA, LEED, founding principal at FXFOWLE. "The team retained the integrity and vision of the original design while capitalizing on design and construction opportunities to reinvent, revitalize, and sustain this dynamic, world-class facility." 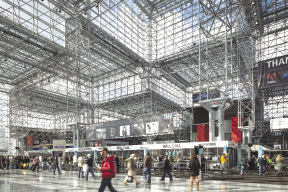 "The project team and show managers worked together so that Javits remained fully-functional throughout its renovation," said Jay Badame, president and chief operating officer for the New York, New Jersey and Pennsylvania regions of Tishman Construction. 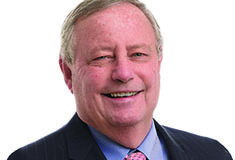 "Building Information Modeling (BIM) tools were utilized to facilitate the planning and implementation of a phased schedule and coordinate extensive logistics that ensured public safety and kept the project on track." The redesign of the Javits Center's interior focused on upgrading organization and efficiency, as well as occupant comfort. The more transparent curtain wall, less opaque skylight systems, and light gray paint on the space frame have dramatically transformed the voluminous public spaces. New mechanical systems have improved the indoor air quality, reduced ambient noise, and significantly saved on energy consumption. The diamond-patterned Tuscan red terrazzo of the original floor has been replaced with soft tones of gray terrazzo. A new high-performance curtain wall has simplified and lightened the aesthetics of the original faÃ§ade by changing the faÃ§ade's module from five-by-five-foot to five-by-ten-foot. This allowed for the introduction of more transparent glass with minimal structurally glazed mullions. Solid stainless steel panels replaced the opaque portions of glass to better express the building's functionality. A 6.7-acre green roofâ€”the second largest in the U.S. and the largest in the northeastâ€”mitigates the heat-island effect of the building, increases thermal performance, helps protect the roof membrane, reduces storm-water runoff by an average of 40%, enhances the aesthetics of the building when seen from above, and creates a natural wildlife habitat.